Located just 2 miles south of Noel on Highway 59 and nestled between the bluffs and Bluff Dwellers Cave is The Cavern Inn. 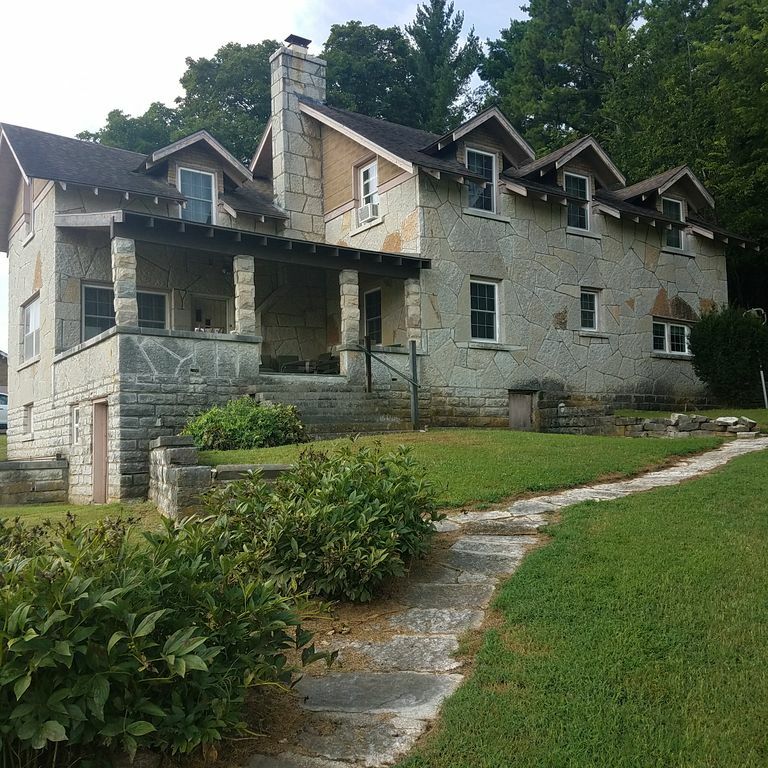 The limestone house was home to C. Arthur Browning, who discovered Bluff Dwellers Cave in 1925. This limestone house was originally built in the late 1920’s and as the family grew, an addition was added which almost doubled the size of the home. What was once 5 bedrooms upstairs has been converted into 3 rooms, each with its own private bathroom. In addition to the kitchen and open living room, the main floor has a queen bedroom which is handicap accessible. Upstairs there are two king bedrooms and one queen. Linens and towels are provided. Noel is known for beautiful cliffs and limestone overhangs along Missouri Highways 59 & 90 as it winds along the Elk River. Elk River offers lot of opportunities in Noel for river rafting, canoeing, and kayaking so it’s close enough for adventure and far enough to qualify as a true escape! Fall is particularly beautiful when the trees are vivid with an autumn palette of red, orange, gold, and brown. The Inn offers breathtaking views of the bluffs and pond. Modern amenities include Wi-fi, tv, (no cable), dvd player, and private bathrooms. The common area is expansive and occupies most of the main floor. There’s a fireplace and windows surround the room. The kitchen is at the back of the house and has windows on three sides affording breath-taking views of the wooded area. Snacks, tea and coffee are available here 24/7. There’s always ice in the refrigerator for our guests. You’ll enjoy sitting out on the patio. It’s awesome with a granite inlaid floor and ornate ceiling fan to circulate the air. The back patio has a BBQ grill, but you'll need to provide your own charcoal. Nearby attractions include Crystal Bridges (45 minutes), Precious Moments (1 hour) Roaring River State Park (1.5 hours), Grand Lake 'O the Cherokee (45 minutes) and numerous sites for canoeing and rafting are within 2 to 5 miles of The Cavern Inn. Branson, MO is a little over 2 hours and Eureka Springs, AR is about 1.5 hours. We are 2 miles south of Noel, Missouri, next door to Bluff Dwellers Cave. Patio located at front of house is covered and has a ceiling fan. Seating available for 12 or more people. Back porch is covered. There is a BBQ grill, charcoal not provided. This space was perfect for two couples and two singles. Each had a private bedroom and bath. Large living room with enough seating for all. We brought a firestick so we could watch any show we wanted through wifi as tv is limited otherwise. Large kitchen had plenty of space for several of us to be preparing a meal at the same time. Owners are very friendly and considerate, and they provide lots of little extras to make the stay very enjoyable. The house was great and very roomy! The house was very lovely and charming! You can definitely host multiple people there comfortably! Amazing house with so much charm! Nice setting and lots of room for group getaway.